The retro renaissance is in full swing in the NBA. There are vintage inspired uniforms worn by the Golden State Warriors and Kobe's overbite is back with a vengeance and poor shot selection to match. Players are also taking vintage cues when it comes to their off-court wardrobe. For the past few seasons, menswear has become enamored with preppy styles and a cleaner version of 90's hip hop references. Gone are the baggy jeans, Rock and Republics and all iced-out everything. Now, wardrobes are full of snapbacks, Starter jackets and a bevy of Ralph Lauren. The varsity jacket is a classic that can work in every man's wardrobe when worn appropriately. American streetwear brands are all offering their own branded take on the Letterman style. While luxury fashion houses like Rick Owens and Balmain mixed unexpected fabrics and fitted silhouettes for a modern interpretation on the classic, NBA stars have recently started designing their own personalized varsity jackets. Let's take a look at some of the style highlights when it comes to the varsity jacket and how you can put your own look together without the high price tag and endorsement deal. When it comes to the most popular brand, Nike comes out on top. Nike Sportswear launched an aggressive marketing and design campaign this year focusing on their classic Destroyer jacket, their version of a varsity jacket. At events across the world, and at the Nike Sportswear flagship store in New York City, the blank canvas is customized with the help of Nike designers. They brought on cities, trend setters and their own roster of athletes to showcase the styling options. Nike's reigning king, LeBron James, was the first NBA athlete to début his custom Nike Destroyer jacket. He's been followed by burgeoning fashion designer Amar'e Stoudemire as well as his teammate, Chris Bosh. When you're out hunting for the perfect varsity jacket, the key thing to keep in mind is shape and fit. Lay the jacket out and make sure the waistband, usually made of a stretchy material, isn't a lot smaller than the shoulder width. If the jacket makes a definite v-shape, it will likely look like that on you -- too big in the shoulders, too tight in the hips and could give you a gut that otherwise isn't there. 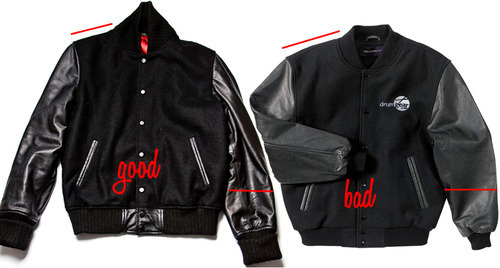 Make sure the shoulders fit properly as many cheaper varsity jackets will have a tiny collar and huge shoulder, and not a more even distribution. Also, many jacket sleeves tend to widen or be very large in comparison to the body of the jacket. Remember that anything can be taken in, but likely not let out. It's better to size up, then tailor down to the get best fit. In terms of materials, the Letterman style standard is a wool body with leather sleeves and optional iron-on or sewn-on letters. If you want the jacket to last, leather is a better option than vinyl sleeves as it is more breathable, meaning you won't have to dry clean it as often. The best places to look for a quality jacket are eBay or a local vintage store. It takes some digging, but you can find some really interesting or limited pieces. If you feel like getting creative, you can find letters, numbers or have a logo made to style a basic piece into something personal. Here are a few of my picks for varsity jackets on budget, as a bespoke or limited edition Nike Destroyer jacket will cost you upwards for $2000. Layering thin materials in classic patterns and fabrics -- such as chambray and gingham -- with denim and boots is an easy way to look polished but casual from now until early spring.